Hi, my name is Babe, or The Babe (just like Babe Ruth). I once had a good life, in January/02, I was sent to the Delta SPCA in Canada, because my Mom had died, and there wasn't anyone to take care of me. I was a very happy, easy going, loveable boy. A family adopted me, the shelter grilled them with questions and they answered everything correctly, and now I want to know why they adopted me. I was shoved into a cage in their garage, fed garbage, tormented by the kids. My soul, my spirit slowly started to die. I suppose they got tired of ignoring and hurting me, and sent me back to the shelter. 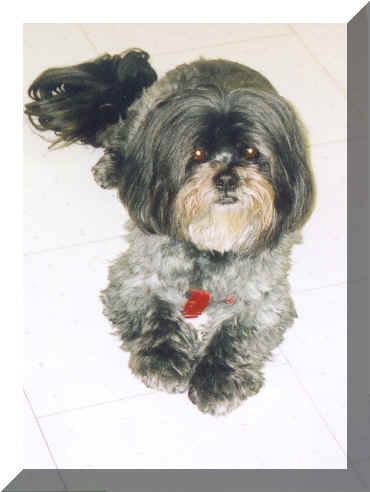 Two weeks I was taken care of by a wonderful lady, named Jackie, but she wanted me to be with someone that understood a Lhasa, and could try to help me. Now I am with Furbaby. Here my story begins, I met Babe, I was unsure of the dog that would be entering my home, from all that he had endured, I saw in his eyes, the wonderful dog he was and will be. He put his paws on me, and instantly became my friend, he trusted me. His pain reflected in his eyes, but I saw his beauty, and now the process will begin to return his spirit and to start reliving, and understand he will never be tormented again. The Delta SPCA has filed charges for animal cruelty, and these people are being charged. I know the penalty will not be enough, They took a loving dog, and destroyed his mind, spirit, heart, soul and body. I feel confident that his wonderful being will be returned, but he will always have the scars of his tormentor. Oct. 4/02: Surgery has been scheduled for Oct. 14, in Bend Oregon, and he will remain there, to join Barbara Grabell ( Peach) to recoup and join her new loving family. I have received enough money to have the surgery done. I thank all of you so much for helping Babe, begin a new life. Donations are not needed for him, but please look at Dollie, she needs you now. Oct.14/02: Surgery went very well for darling Babe (nka Cole) besides the cruiciate, he had to have his dew claws removed, and a fatty tumor. Oct. 16/02: Cole is recuperating, and not liking being confined, but necessary for his rehabilitation. Nov. 16/02: Cole is doing great, and thank you Barb for helping and loving another Baby in need.
" hard to believe this is the same dog"
I cannot thank his owner Barbara for her dedication and care she has given this boy. Thank you Ana Marie & Jackie for helping our Babe! Sherri Pangelinan of Portland, Or. for no heart in all the world is greater than the loving heart of me. the things you would have me learn. when your footstep falls upon my waiting ear. for I am a domesticated animal no longer accustomed to bitter elements. than the privilege of sitting at your feet beside the hearth. for I cannot tell you when I suffer thirst. to protect you with my life, should your life be in danger. do not make heroic efforts to keep me going. I am not taken gently.